‘Do you ever remember sitting on the bus on your way home from work and it lashing rain outside? You could smell the wet and damp off everyone. I remember one time I was sitting in by the window and falling asleep from the rhythm of the bus when this great big man sat in beside me and nearly crushed me to death. And to make it worst, he stank of drink and started singing, at 6 o’clock in the evening!!! And there I was just settling into a nice little snooze. 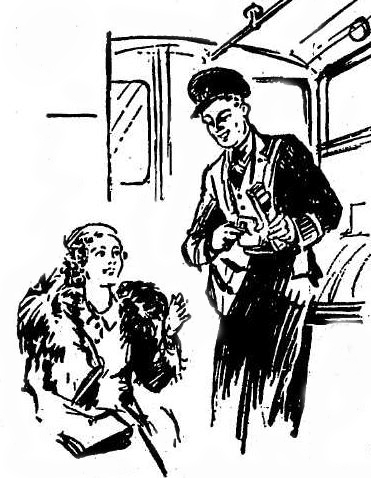 Then the Busman had to come along rattling a load of coins in his hand, “Fares now, ladies and gentlemen, please...”. And then there was what the Da’ used to call “The Television Seat”, you know that long seat up at the front? You’d be looking down at everyone with their long wet faces on them. The Busman’s pal would always stand in under the stairs where the pram and newspapers used to go. And he’d even hit the bell sometimes for the bus to stop for people. And do you ever remember that trick the Oul Fellas used to do jumping off the bus backwards as it was moving? I tried that one time and nearly killed myself when I fell on the road and went flying along after the bus. “Here mister, gis a roll” and out he’d throw one of them paper rolls that he used to put in the ticket machine and you’d be thrilled if you got one.